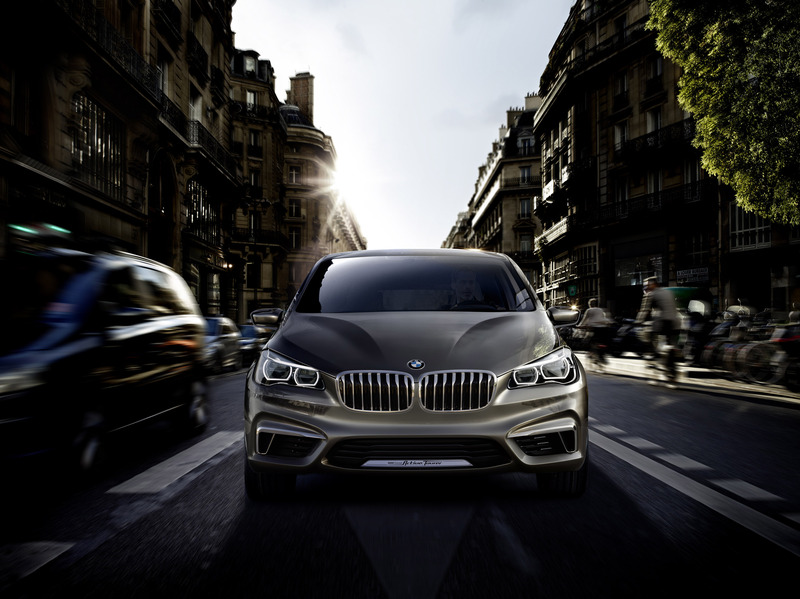 With the new BMW Active Tourer Concept, BMW presents a vehicle at the 2012 Paris Motor Show which is the first in the premium compact segment to combine comfort and space functionality with dynamic performance and style. Annual growth rates of up to five per cent are expected in the small car and compact segment of the premium class in the years to come. For this reason, the BMW Active Tourer Concept is a key component in the ongoing development of the BMW brand and its model portfolio. As a plug-in hybrid, the BMW Active Tourer Concept also provides a glimpse ahead to future drive variants in automobiles of the compact class. The eDrive concept familiar from the BMW i8 is used here for the first time in a model of the core BMW brand and will in future be the designation for all electric and plug-in hybrid drives. 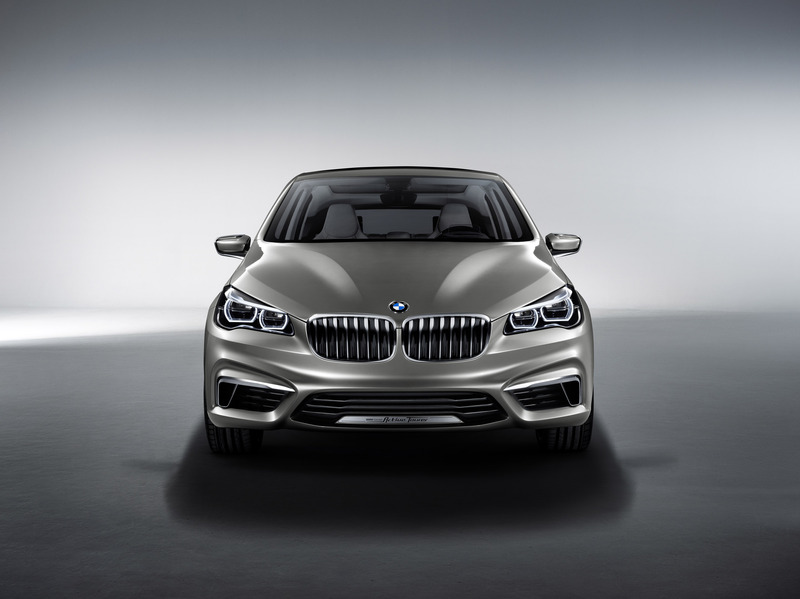 It covers all components of the electric drive, the electric motor developed by BMW, the lithium-ion battery and the intelligent engine control unit. 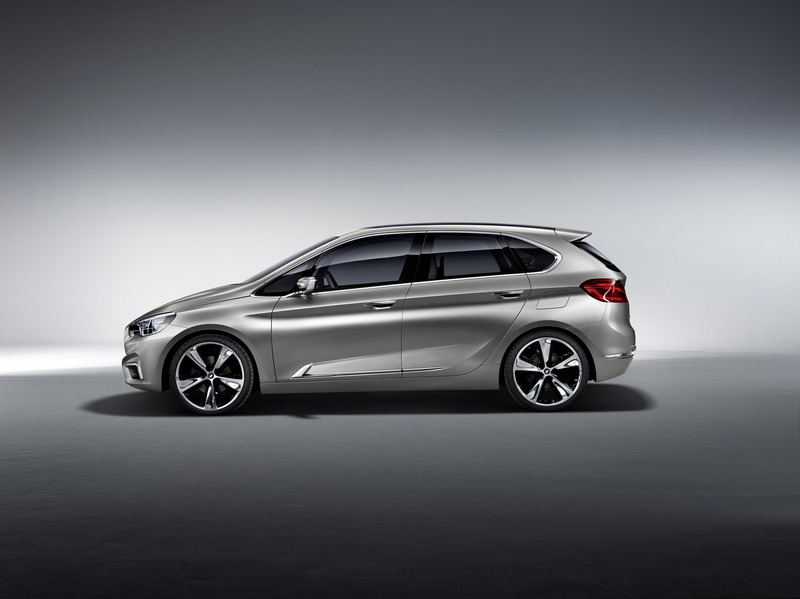 The new BMW Active Tourer Concept combines compact dimensions and an attractive, sporty design with hallmark BMW quality. 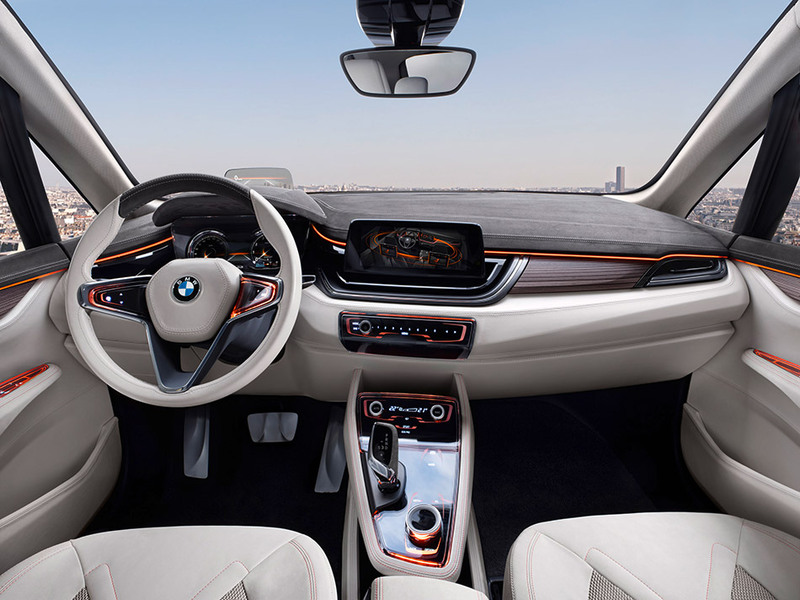 With an exterior length of 4,350 millimetres, a width of 1,834 millimetres and a total height of 1,560 millimetres, the BMW Active Tourer Concept is geared towards customers of the premium segment who appreciate a high level of comfort, a raised seating position and a generous amount of space. 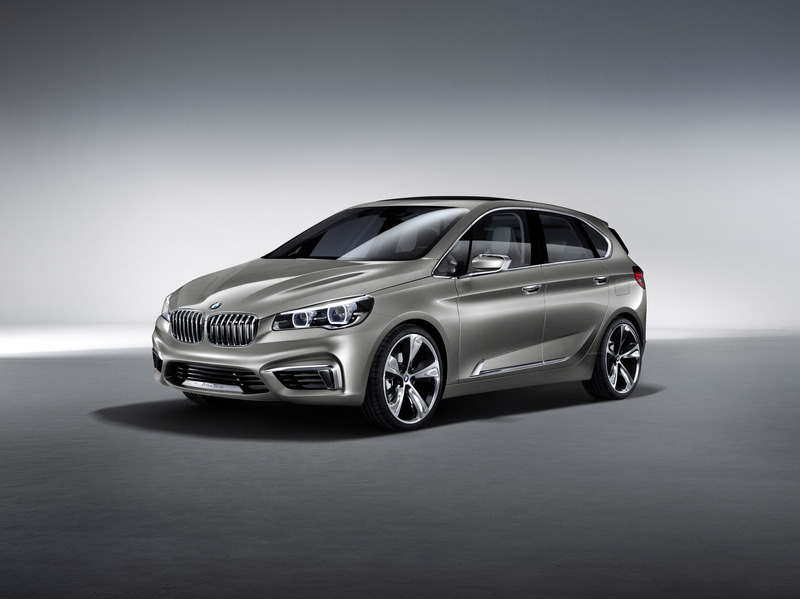 The BMW Active Tourer Concept will also be attractive to families who attach importance to functionality and versatility as well as lifestyle and athletic flair. A long wheelbase of 2,670 millimetres, a high roof line and a compact transverse engine with front-wheel drive make it possible to create a generously sized interior. The spacious load compartment of the BMW Active Tourer Concept provides fully-fledged everyday suitability since the batteries of the hybrid drive are housed entirely underneath the load floor. 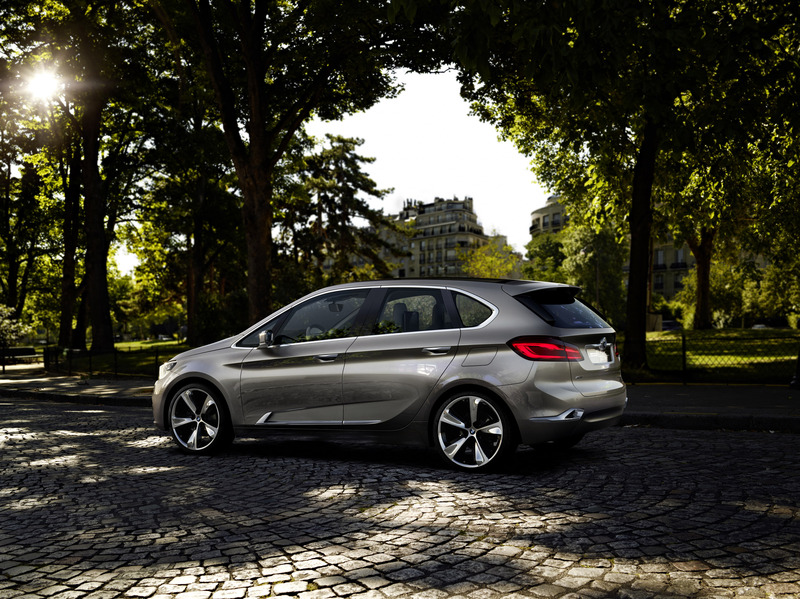 With its harmonious proportions the BMW Active Tourer Concept displays sporty elegance from every angle. It demonstrates how compact dimensions, functionality and versatility can be skilfully combined with a dynamic design. The exclusive exterior paint finish in High Reflection Silver contributes to the refined appearance of the BMW Active Tourer Concept. Meanwhile, interesting touches are provided by the additional applications at the front, side and rear. The surfaces are in high-gloss polish with brushed velvet matt on the undersurface. This subtle shimmering between matt and gloss emphasises the play of light and shadow created by the new exterior paint finish. 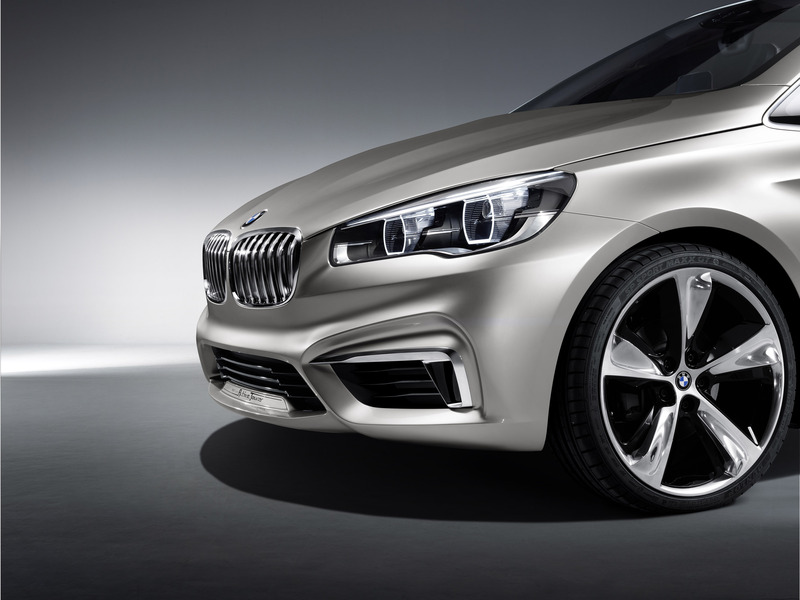 The BMW Active Tourer Concept unmistakably retains the characteristically expressive BMW front view. 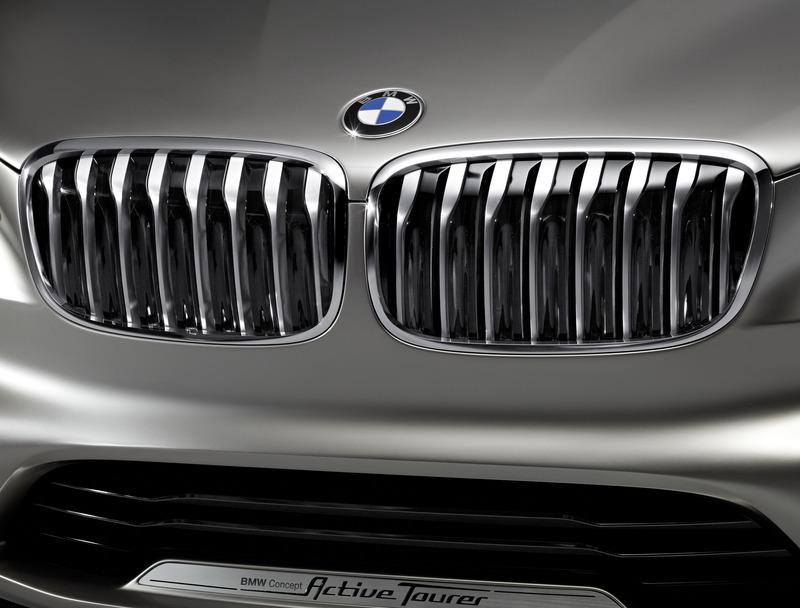 The dominating element here is the distinctive, slightly front-tilted BMW radiator grille. The striking twin headlines with LED positioning lights (eyebrows) stretching far back into the side panels and the multi-faceted front apron combine to reinforce the sporty presence of the BMW Active Tourer Concept. Furthermore, the two large outer air inlets below the headlights emphasise the impression of width created by the front view. Seen from the side, the elongated silhouette with its suggested wedge shape gives the BMW Active Tourer Concept a dynamic feel even when stationary - something which is unique in the class. Integrated door openers and the strikingly contrasted side sills with their rising shadow line combine with the large 20-inch wheels to give the BMW Active Tourer Concept its sporty, elegant appearance. Short body overhangs at the front and rear and the long wheelbase make for an unusually generously sized interior considering the vehicle's compact exterior dimensions. The raised roof line and large doors at front and rear promise convenient access to all seats. Meanwhile, the rear section of the BMW Active Tourer Concept is characterised by athletic elegance. Marked, horizontal body lines define the rear view of this compact BMW. The large rear light clusters running well into the side panel highlight the broad wheel arches, visually underscoring the vehicle's solid road-holding. The large tailgate with low load sill and wide opening provides convenient access to the luggage compartment. The generously designed interior of the BMW Active Tourer Concept is both transparent and refreshingly new. The open-pore laminated wood milled from a single block provides the visual link between the upper and low decor surfaces of the instrument panel. This creates a very elegant and light overall impression in the front section of the interior. The door trim panels and seats are covered in light, velvety soft full-grain leather and smooth leather, providing a silky, shimmering gloss which emphasises the luxurious, elegant ambience of the interior. There are also orange contrasting seams which underscore the vehicle's sporty character. The BMW Active Tourer Concept offers an entirely new sense of space. The centre console appears to hover between the two front seats with a smooth transition to the dashboard. This arrangement guarantees maximum legroom for both driver and front passenger. The cockpit with hallmark BMW driver orientation provides optimum accessibility of all the main controls. The circular instruments in Black Panel Technology are within the driver's field of vision, as is the monitor of the central information display. As an optional extra, a full-colour Head-Up-Display appears on a special retracting glass surface between the steering wheel and windscreen - a first in the compact segment. The raised seats in the so-called semi-command position also ensure an excellent all-round view, rounding off the optimum level of operating convenience and comfort. "Cool Shade" panorama roof: changes spatial feel and temperature at the press of a button. An innovative panorama sunroof creates a unique ambience, extending across the entire roof surface of the BMW Active Tourer Concept. The composite glass roof with innovative Suspended Particle Device (SPD) technology means that the desired brightness or temperature effect can be created at the press of an electric button - either being darkened to the level of powerful sunglasses or raised to crystal clear brightness. Occupants can achieve a special lighting effect by manually adding a large-area leaf structure design to the glass roof. Electrical impulses cause the molecular structure of the glass to change at continuously varying levels between light and dark according to preference. The play of light and shadow thus created highlights the sense of space, thereby generating a pleasantly atmospheric lighting effect on all seats. 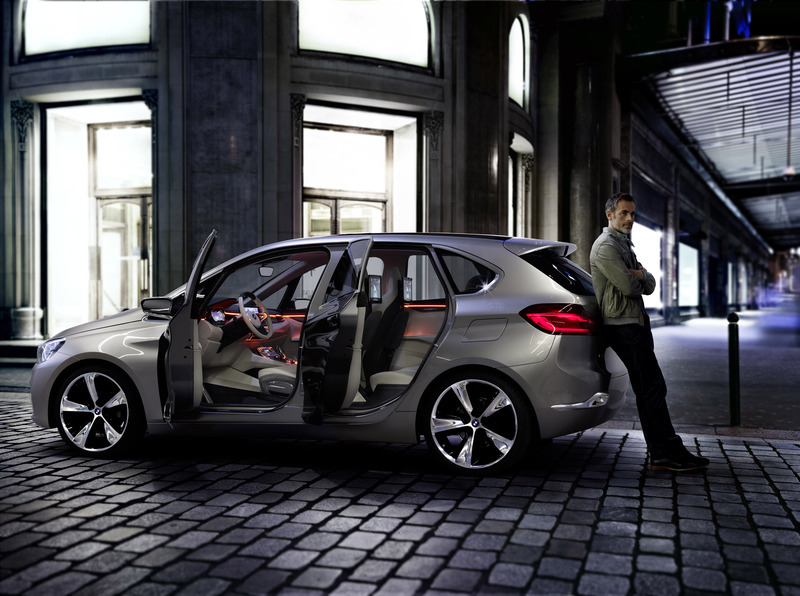 Rear passengers likewise enjoy very comfortable seating in the BMW Active Tourer Concept. The generous leg space created by the long wheelbase and slightly raised roof gives passengers plenty of freedom for movement. This also makes it particularly easy to enter and exit the vehicle. The luggage compartment is highly versatile due to the variable rear backrests, which can be split 40 : 20 : 40. A flat load floor can be created by folding down all three backrest sections. In addition to these variable luggage space expansion options, the BMW Active Tourer Concept offers rear passengers additional intelligent details as part of the Travel & Comfort System. A centrally located vertical metal track is integrated in the back of the front seats. This innovative clip-on track system allows folding tables offering a range of convenient adjustment options to be attached by means of a quick fastener, and additional storage bags can also be suspended. Use of all common models of tablet computer is especially convenient from the rear seats. Tablets can be fixed to the clip-on track system in either portrait or landscape format and used for internet search, games or relaxed movie-viewing at eye level. A particular highlight of the BMW Active Tourer Concept is the multifunction instrument display. Instead of a conventional instrument cluster with four analog circular instruments providing the driver with information on speed, engine speed, fuel level and oil temperature, there is a 10.25-inch integrated screen which makes for a modern display experience. The familiar look with four circular instruments is still retained, but the use of extended Black Panel Technology gives the drive a whole new range of display options. For example, the screen shows the drive experience modes COMFORT, SPORTand ECO PRO with differing indicators and in distinctive colour schemes, thereby ensuring increased safety and efficiency as well as exemplary driver orientation. As a result, the instrument cluster provides the driver with information which perfectly matches the situation on the road. "Seismic Surf" app for economical driving made easy. Rear passengers in the BMW Active Tourer Concept can experience fascinating technology hands-on with the new iPad app "Seismic Surf". "Seismic Surf" creates a game world in real time. It is an exciting ecological racing game which draws on the acceleration figures, engine speed and other data supplied continuously by the BMW Active Tourer Concept. Each real-life driving situation is interpreted and used to generate an infinite variety of new challenges in the computer game. 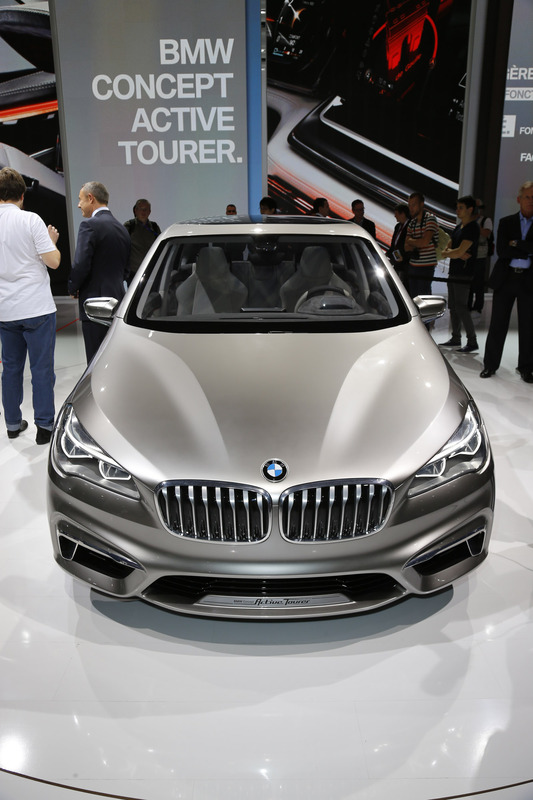 The BMW Active Tourer Concept is fitted with the latest-generation multicolour Head-Up Display. It projects all important information in brilliant resolution directly into the field of vision of the driver via a retracting glass surface. The intensity of projection automatically adapts to the light available. The day and night design is the same as that of the instrument panel. Depending on the driver's preference, not only the current speed and speed limits can be displayed but also overtaking bans. The driver can also obtain navigation assistance as well as a range of warnings. Because of the large number of driver assistance systems available, the scope of information which can be displayed in the Head-Up Display has reached a level as yet unequalled in this class of vehicle. The drive system of the BMW Active Tourer Concept: the future begins. 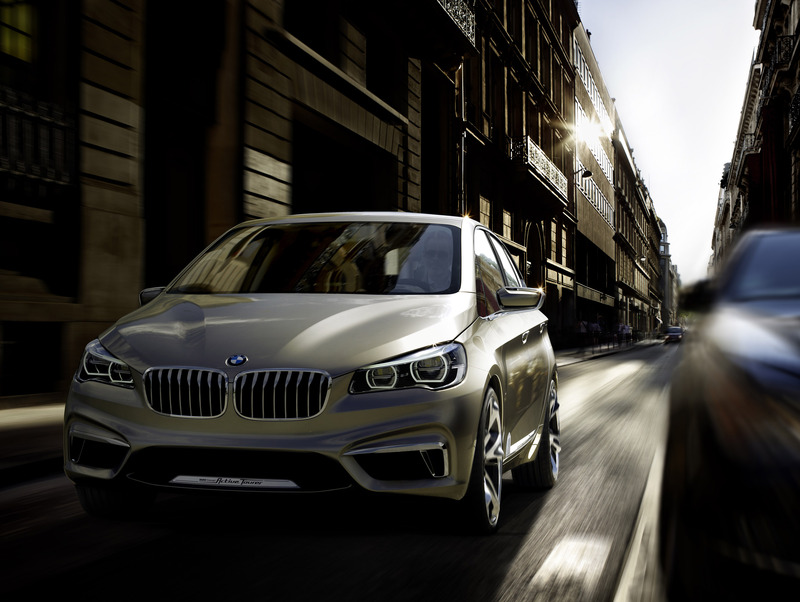 The drive of the BMW Active Tourer Concept follows the BMW Group's pioneering philosophy of sustainable mobility. The drive technology of all BMW plug-in hybrid models and electrically powered BMW i models bears the designation BMW eDrive, a term which includes all electric drive components. 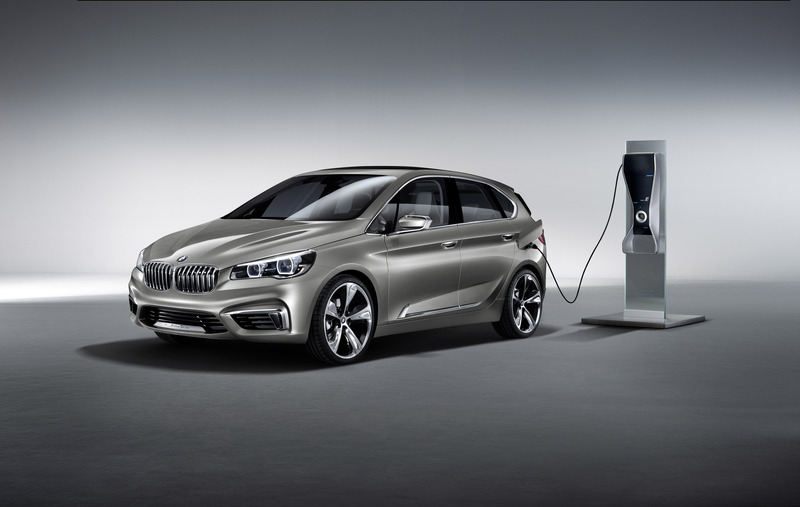 The BMW Active Tourer Concept has been designed as a so-called plug-in hybrid - ideally combining the benefits of electric drive with those of a classic combustion engine. The plug-in hybrid (PHEV = Plug-in-Hybrid Electric Vehicle) will have a particularly important role to play in future. This is because plug-in hybrid vehicles normally have a range of well over 20 kilometres when run on electricity and can therefore be used efficiently for both short and long trips as well as in mixed mode. In the case of the BMW Active Tourer Concept, a state-of-the-art 1.5-litre petrol engine from the BMW Group Efficient Dynamics family of engines interacts perfectly with a synchronous electric motor. 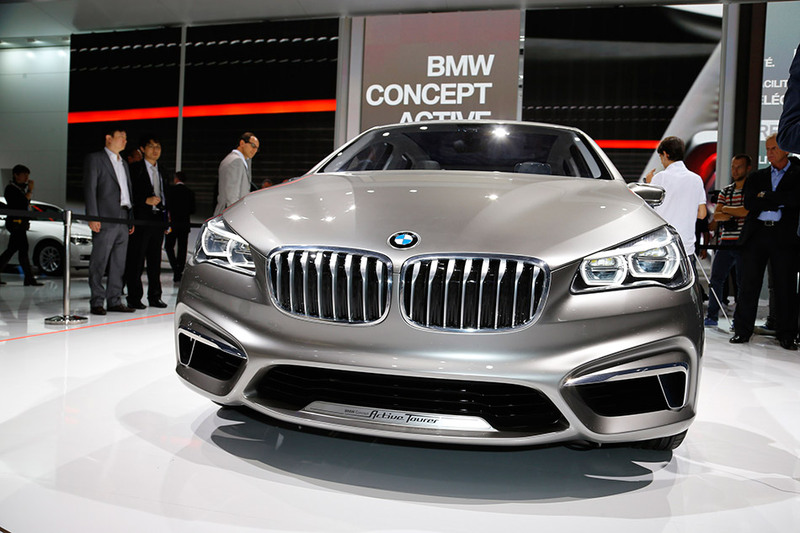 The BMW Active Tourer Concept presents a drive concept which is new to the BMW brand. The 1.5-litre petrol engine does not drive the rear wheels - as has been the case in BMW models to date - but the front wheels. The electric motor of the BMW Active Tourer Concept is designed as a fully-fledged power unit and acts on the rear axle, if necessary powering the car on its own. With a system output of over 140 kW/190 bhp, the combination of combustion engine and electric motor enables the BMW Active Tourer Concept to achieve highly sporty performance figures while maintaining extremely low fuel consumption and emission levels. The BMW Active Tourer Concept accelerates in less than eight seconds from standing to 100 km/h, while the maximum speed achieved by the dynamic plug-in hybrid is around 200 km/h. In spite of these impressive performance figures, the average fuel consumption is less than 2.5 litres per 100 kilometres, with a CO2 emissions level of less than 60 g/km. In addition to convincing performance figures, the innovative drive concept also gives the BMW Active Tourer Concept a driving response which is both comfortable and dynamic. The combustion engine of the new BMW Active Tourer Concept is a new cutting-edge 1.5-litre engine with BMW TwinPower Turbo Technology. Derived from the multiple award-winning 6-cylinder engine with BMW TwinPower Turbo Technology, it combines the latest generation of High Precision Injection with the fully variable valve control system VALVETRONIC and ultra-modern turbocharging. BMW TwinPower Turbo Technology will be used in all power units of the BMW Group's Efficient Dynamics engine family in the future - not least because it does not depend on total capacity or number of cylinders. The new 3-cylinder engine in the BMW Active Tourer Concept is one of the first representatives of this new generation of engines. The compact in-line engine constitutes an exemplary combination of dynamic performance and efficiency. 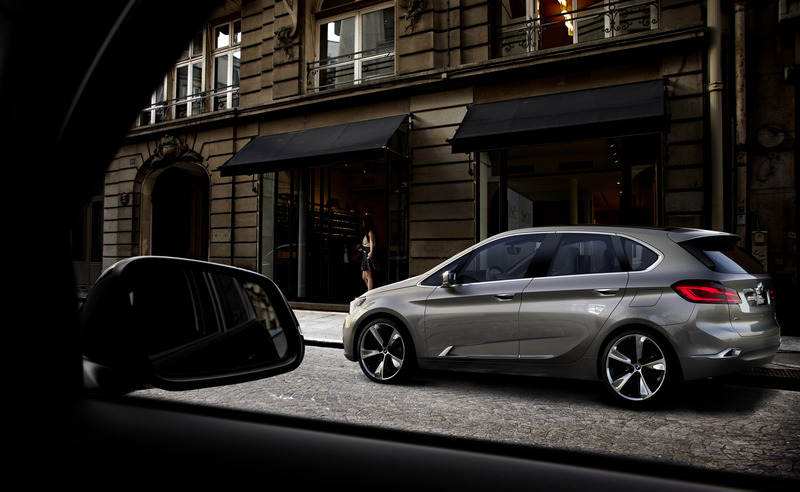 The synchronous electric motor in the BMW Active Tourer Concept was also developed by the BMW Group. With a fully charged battery, the BMW Active Tourer Concept has a maximum range of over 30 kilometres when running on electric power alone. This means that the majority of day-to-day trips dispense with local emissions entirely. What is more, the boost function can be applied to use the power provided by the synchronous electric motor for such things as highly dynamic acceleration manoeuvres. In both cases the drive power is made available spontaneously and without delay. The maximum torque of 200 Newton metres is available from standing. 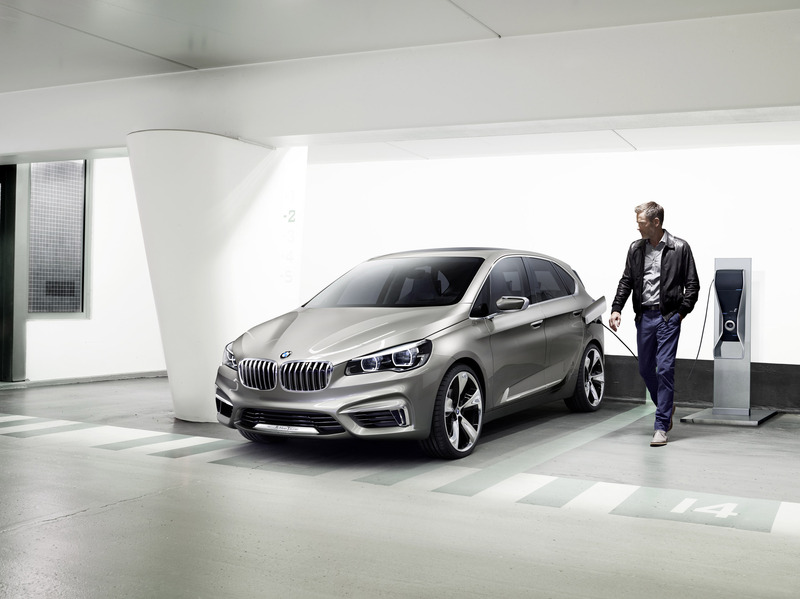 The lithium-ion battery of the BMW Active Tourer Concept can be charged at any 220 volt household power socket. Power can be drawn from both axes of the BMW Active Tourer Concept and fed into the lithium-ion battery so as to enhance the efficiency of the plug-in hybrid. While the electric motor automatically recuperates maximum energy at the rear axle during deceleration, a high-volt generator connected to the combustion engine additionally charges the battery whenever needed. As part of the BMW Group's Efficient Dynamics strategy, the BMW Active Tourer Concept also features a measures package specially geared towards the plug-in hybrid to increase efficiency. For example, an anticipatory operating strategy optimises the efficiency of the electric motor and the high-performance battery. The system draws on data provided by the navigation system, calculating in advance the most suitable sections of the route and driving situations in which to apply electric drive or charge the battery. This optimised charging strategy saves up to ten per cent of energy so as to extend the amount of travel time during which the vehicle runs on electrical power alone. The new BMW Active Tourer Concept naturally includes numerous other features of the BMW EfficientDynamics strategy, too. In the case of the BMW Active Tourer Concept, these are all mainly geared towards maximising the range of the vehicle when running purely on electricity. This involves optimising the energy consumption of the ancillary units. Every kilowatt of stored energy saved is thus instantly available to power the electric motor. The BMW Active Tourer Concept is fitted with the ECO PRO mode which is also available in current BMW serial production models. This additional method of cutting fuel consumption remains globally unique in the automotive sector to date in this form. At the appropriate opportunities, ECO PRO mode reduces the power of the interior air conditioning and other electrically powered comfort functions, ensuring drive components operate on maximum efficiency according to the current situation on the road. ECO PRO mode also provides the driver with valuable advice. To this end, this system is linked to the navigation system. Based on the calculated route data and the driver's individual style of driving, ECO PRO mode is able to indicate how to reach a given destination with the lowest level of fuel consumption, for example. The preview assistant gives the driver tips such as "Remove foot from accelerator" if a tight bend or speed limit is approaching which the driver cannot even see yet. The preview assistant can take into account such features as bends, built-up areas, roundabouts, T junctions and motorway exits. At the same time, an anticipatory transmission assistant optimises the electronic transmission control system for imminent situations.